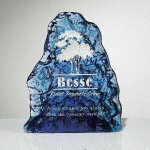 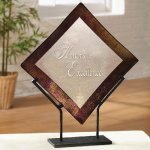 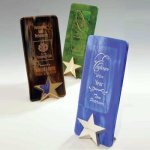 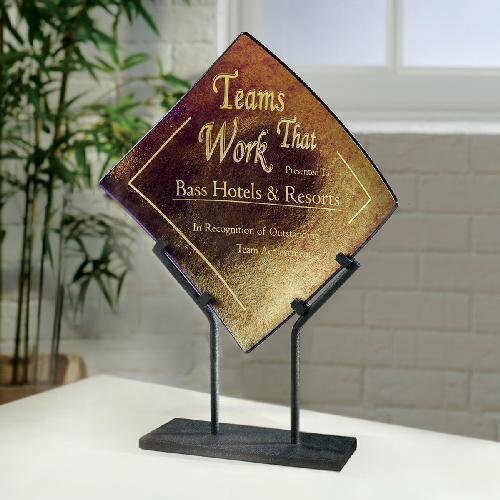 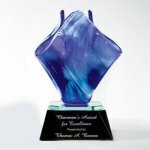 Marbleized blue & green or tortoise shell brown art glass is fused together with black stringer glass for these dramatic awards which are mounted to our cast star base in either 24k gold or silver plated finish. 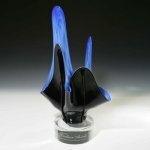 Each piece is hand made and signed by the artist. Brown w/Gold Star 10" x 4"
Green w/Gold Star 10" x 4"
Blue w/Silver Star 10" x 4"
This spectacular award is a circle of Art Glass accented in rich golden and bronze hues on a black glass base.